You can ski in and out of our Valfrejus apartment building. 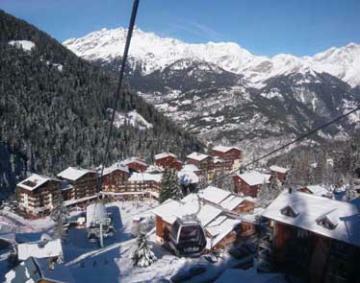 Very well located just 100 metres walk from the centre of this excellent family ski resort. Residents have free access to the fitness centre and sauna, laundry and drying facilities. There is a lift in the residence and for a supplement indoor parking is available. Grenoble airport 193km. Lyon airport 201km. The accommodation comprises 31 square metres of living space including a living and dining area with two pull out single beds. Open-plan, fully equipped kitchen. Double bedroom, a bathroom and separate toilet. We have a number of almost identical apartments of this size in the property, decor and furnishings vary a little from one to another. There are plenty of shops and restaurants in resort along with plenty of bars for apres ski evenings. Property made available in good order and fully equipped. Wi-fi access. Access to fitness centre and sauna. Local taxes (except taxe de sejour detailed below), reasonable consumption of services including water, gas and electricity. Wi-fi connectivity. Refundable deposit payable locally 260€. Linen and towels "kit" available 10€ per kit. Final clean payable locally in cash, between 56€ and 104€ - ask for details. Taxe de sejour payable locally 1.05€ per person per day. Additional services (where available) including cleaning, babysitting and cooking. Parking in indoor car park) 9€ per day. Pets supplement 6€ per day.